This is a perfume house that has been active since the 60’s, and as with anything that survives such a decade, the memories may be a bit blurred by time and opiates. Diptyque was not created as a perfume house originally, rather the emphasis was on objects for the home (two of the founders worked for the venerable London firm Liberty’s) but they added a fragrance in 1968, L’Eau based the site says on pomanders. This serves to give you a taste of the aesthetic behind Diptyque. It was to begin with visual, somewhat antiquarian, and the British taste for both dominates here, a world away from very French houses like Annick Goutal. 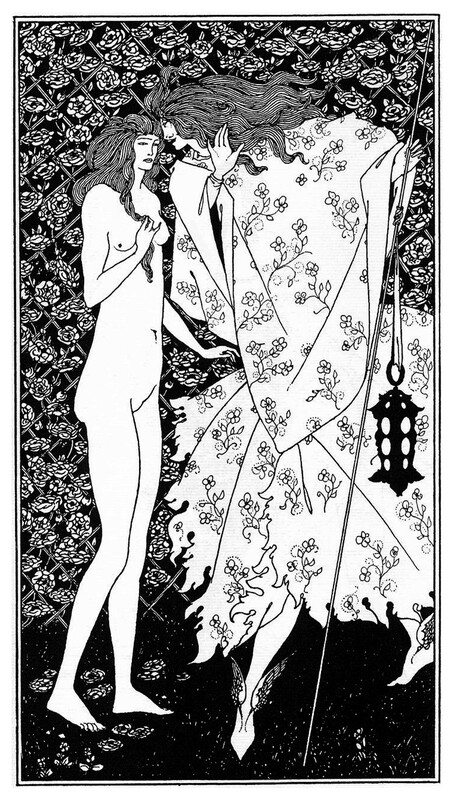 In other word what we have is more Aubrey Beardsley than Boucher, and the gilding gives way to black and white drawings. In fact, the ink print austerity of Diptyque has served to lend the business one of the strongest and most instantly recognizable presentations in perfumery. In many ways their ersatz Edwardian graphic labels and bottles give them an edge over the ubiquitous rectangular minimalism of other firms whose packaging will probably become dated in a few years time. Diptyque on the other hand always knew their own style and that individuality has served them well. The perfumes though have been another matter. If the homogenous look has been a success, the fragrances have been eclectic, and uneven. They have done well out of hits like Do Son (tuberose), Tam Dao (sandalwood), L’Ombre Sur L’Eau (cassis/rose), and, arguably one of their best, Phylosykos (fig) composed by Olivia Giacobetti. The only Diptyques I ever owned were Virgilio and Ofresia, respectively a strange thyme and basil-centric perfume and a freesia soliflore. Virgilio smelled so like a garden in Italy that I couldn’t resist it, and now all these years later have trouble remembering the exact nature of the scent which has been mostly unavailable since. The perfume was typical of the original idea behind the Diptyque scents namely travel. Each one of them was supposed to be the evocation of some place that the founders had visited and brought back to bottle for the enjoyment of armchair travelers everywhere. Virgilio was indeed supposed to recall a crumbling old Italian garden, someplace like the Villa Lante, only more neglected, decaying slowly in its own green shade. Then there was the very accurate freesia perfume Ofresia (also done by Olivia Giacobetti) which I owned in shower gel form and loved to death. I used to bathe my daughter in it when she was a baby and I liked the peppery underpinnings of the scent, although a number of other people don’t. All I can say is that I do smell some pepper in freesias, and that this scent is one of the few opinionated florals out there, the pepper sneezes away away the petal frills. They followed with such things as Do Son, which was supposed to conjure up Haiphong, and have continued to the present with bottled landscapes. Their latest release Florabellio is meant to make you think of apple orchards in bloom and was some eight years in the making. I was surprised to find that the scent of apple orchards includes Calone, which is not what I recalled from an ancient apple tree which obliged every May with a wonderful scent. Unfortunately, Florabellio is not nearly as pretty as an apple orchard in flower. They do sometimes produce offbeat perfumes like Oyedo ( a Diptyque-ish take on Edo the archaic name for Tokyo) which is a very odd bubbly citrus scent with a prominent orange grapefruit note and some woody and herbal elements to keep the whole from smelling too much like a soft drink. I still like the stuff, and find it along with L’Ombre Sur L’Eau among the best of the current Diptyques. But all this leads me to a slight worry for this line: Synthetics as in too many of. If what you’re doing is recalling travels, then the smells need some authenticity to resonate to recall somewhere precise on a map. Sometimes synthetics can do this exactly, cf Demeter. At other times they miss entirely and you get L’Eau d Airport. I noticed when I went to a Diptyque boutique that they now display natural essences featured in their scents including their own ylang ylang, lavender, and geranium. So clearly they are making an effort, and these include a ylang centric Eau Moheli, which along with Do Son, I found the easiest Diptyques for Summer if not exciting or unique perfumes. Still, this brand needs to watch its step. Diptyque is nearly niche but since its purchase in 2005, by a private equity group, like Annick Goutal, it may be almost mainstream and in danger of losing the central impetus of its brand: Englishmen Abroad. Do you have a favorite Diptyque destination? Do Son is a lovely tuberose, I agree. It’s also apparently one of the bestsellers over at Diptyque and anyone who loves a good tuberose can smell why: it is easier to wear and less raunchy than Carnal Flower. Do Son would have made a great choice for your wedding, and there probably aren’t many tuberoses that are better out there, though I still haven’t tried Hiram Green’s Moonflower and I gather that’s a must for tuberose lovers! Moon Bloom is pretty great! Very natural, of course, and soffffft for a tubey. Sadly, it lasts all of 80 minutes on me. I have scent-eating skin anyway, but tuberose is one of the few natural as-is notes that *usually* sticks around on me (vanilla is another). Vamp a NY, for example, which is all tuberose-root beer-vanilla, lasts for hours. DSH Rose Vert, a citrusy/green rose, is another with decent longevity. But I digress. Do Son I do not like. At all. There seems to be a synthetic tuberose material widely available, and I sometimes like it and sometimes don’t, depending. It’s one of those aromachems that has a tactile association for me, and this particular one is hard-edged rigid plastic. Synthetic tuberose is “blocky” for me, and Do Son is full of it as well as a watery note that renders the fragrance irritating to me. I don’t *think* I’m being a snob about it… B&BW Velvet Tuberose (which is jam-packed with Cashmeran) I still like. I can tell it’s synth tubey, but it just doesn’t trouble me. I can’t explain it. Haven’t found a Diptyque that I really dig yet. Haven’t really tried many – Eau Rose, Philosykos, Tam Dao, L’Ombre dans l’Eau, Ofresia, and Do Son. Most of these were wearable but sort of dull, except Philosykos which I haaaaate. I might like, what was that one – Jardin Clos? Might like Eau Duelle too. Jardin Clos also has that watermelon note, or did up to a couple of years ago when I last smelled it, Eau Duelle I did sniff but it was faint, sort of herbal vanilla? Do Son smelled good on me and I thought it would be very pretty for summer. But then I’m perfectly happy with Terracotta which is a quite synthetic white flowery/lemon meringue-y concoction. Currently I’m wearing Teo Cabanel’s Lace Garden a very white parasol garden perfume with the jasmine dominating on my skin. This reminds me of Summerscent, but is better, more delicate. So far the Teo Cabanel line has impressed me. Hiram Green is somebody whose work I’d like to try, even if 80 minutes is the limit on Moon Bloom- I’m in! Lace Garden is nice! The one thing that’s stopping me from buying it is, well, that jasmine which orders everybody else around. I don’t know what it is about me and jasmine, when I love all the other BWFs… and I don’t hate jasmine either, I just don’t, well, love it. It generally seems pushy, or something (and isn’t that funny, coming from a BWF lover? ).